ROME (AP) — A painting by Italian artist Artemisia Gentileschi has been found hidden beneath another of the Baroque master’s work, the Uffizi Galleries in Florence said. Infrared, ultraviolet and X-ray analyses of a piece in the Italian museum’s collection, “St. Catherine of Alexandria”, revealed the partial self-portrait Gentileschi laid on the canvas first, the museum said. The Uffizi said this week the examination strongly indicates that to realize her vision of the saint, the painter combined details from the self-portrait with ones from a portrait of a noblewoman, the Grand Duke Ferdinando de’ Medici’s daughter Caterina. The Florence museum said the imaging “revealed a pre-existing version of ‘St. Catherine” beneath the painted surface, sporting a turban instead of a crown” and with the saint facing the observer instead of looking to heaven, as in the final version. On the long-hidden painting there is also a “mysterious little face on the left-side of St. Catherine’s own face, a feature totally out of context with respect to both the finished work and the earlier version” underneath, the museum said Monday. Experts theorized that the face might have been an early sketch for a totally different project that the artist set aside. They also think she re-used a canvas to save on materials. The self-portrait is “virtually identical” to another Gentileschi painting of St. Catherine acquired by the National Gallery in London, the Uffizi said. The Uffizi said restoration experts saw the increasable similarity when they superimposed the images of the newly discovered work and the London museum’s piece. 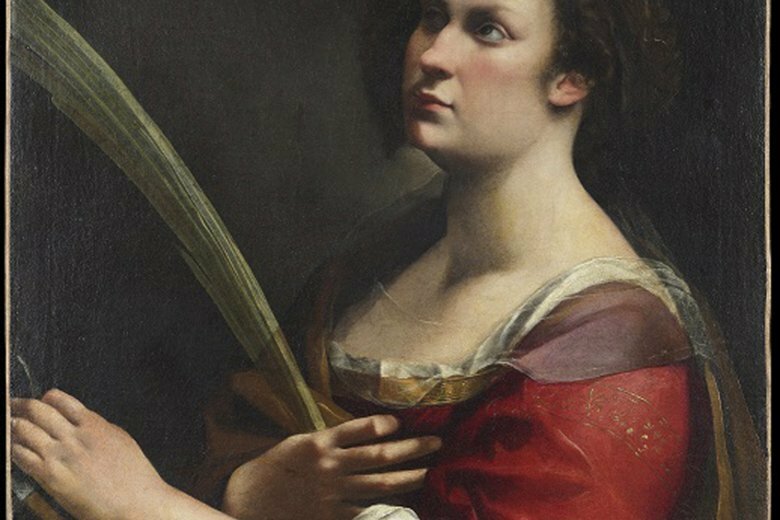 An admirer of Caravaggio, Gentileschi won rare success as a woman in the male-dominated 17th-century art world. She frequently depicted strong female heroines.